1. Heat the oil in a wide non-stick frying pan, then cook the chicken for 5 minutes over a high heat until cooked through (with no pink meat). Remove to a plate. Without adding more oil, add the peppers to the hot pan and fry for 3 minutes or until starting to blister. 2. Stir in 1 bunch of salad onions, sizzle briefly then stir in the stock, 100ml water and rice. Cover and simmer for 20 minutes until the rice has absorbed the liquid and is just tender. Stir now and again as it cooks. Toss the pineapple with the rest of the onion and set aside. 3. Return the chicken to the rice, re-cover the pan and leave it off the heat for 5 minutes. Fold in the parsley or coriander, then serve with the pineapple. 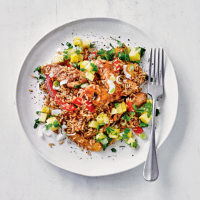 Cook’s tip For a Thai twist on this recipe, use 300g Waitrose British Chicken, Fruity Mango, Coconut And Lime Breast Strips. 2 of your 5 a day.